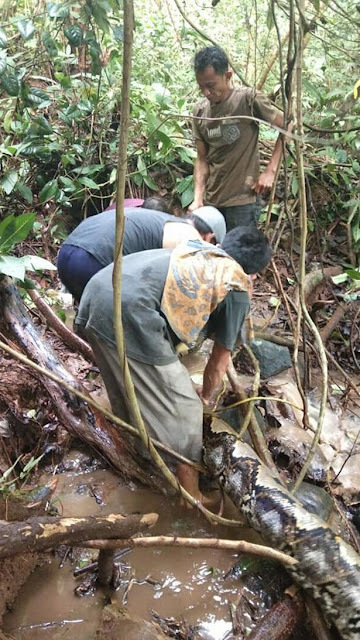 A fisherman was out catching eels when he stepped on what he thought was a log – but the log moved and he realised it was an enormous python. What follows is an extraordinary battle between man and beast as the 27 foot reptile powers through the undergrowth trying to escape. The giant snake then goes into survival mode and instinctively wraps itself around one of the men’s ankles. Six men spent several minutes trying to overpower the 100kg reptile – trying to hold the snake’s mouth to stop it from biting. The snake ended up in a large cage in a village in the Padang Pariaman region where it was kept for several days. Wildlife officials then drove it several miles away to be released away from settlements. Growing up to 30ft long, the reticulated python (Python Reticulatus) is the longest snake in the world. Cardi B cries out: "I miss Offset’s D**k"